The left will still claim Pant Suits is a lock for president in 2016. The former Secretary of State’s favorability ratings have eroded among Independents and Republicans since she left Foggy Bottom. Nearly nine months after leaving office, more Americans have an unfavorable than a favorable opinion of former Secretary of State Hillary Clinton, according to a recent YouGov/Economist poll. 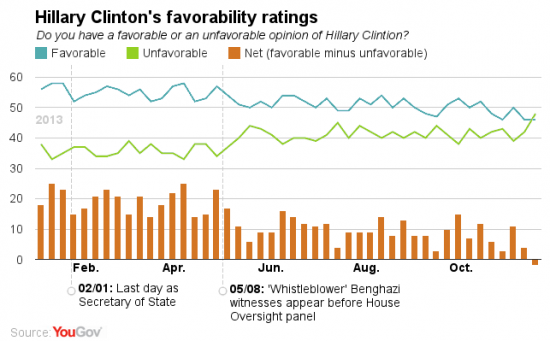 However, Clinton remains the indisputable favorite among Democrats to be their 2016 presidential nomination. During much of her tenure as Secretary of State, Clinton enjoyed generally positive ratings, ratings that continued through much of the spring following her departure from Foggy Bottom: from January through April her net favorability numbers fell below +15 only three times. But starting around mid-May of this year, the positive feelings began to recede and the secretary’s image has not recovered since, with nearly half of Americans (48%) now holding an unfavourable opinion of her, compared to 46% with a favourable one, for a net rating of -2. The idea of Hitlary appeals to the low info crowd. Once her record is rehashed in the public, she is going to sink like a stone. Let's remember that the Rats ended up picking a total empty suit in '08 over her. Why would they pic her now? LOL. That proves two things. First, Juan is of well below average intelligence. That ticket of shrill, over the the hill broads is a loser except for a handful of Feminazis. Secondly it shows that Juan will believe any stupid thing floated out at a DC cocktail party because that is where I think he came up with this absurd idea. even my left leaning wife wouldn't vote for Fauxcahontas. hey, I've seen one of these butts. it's a wonder to behold. the one I saw, with my own eyes mind you, you could put a tea cup on it, it came out horizontal like that. What Happens When Hillary Clinton Isn’t Inevitable?